First time of asking, they had told us there was no way out of here by boat, so we were packing our bags, fitting everything into a collection of tightly-wound plastic bags. 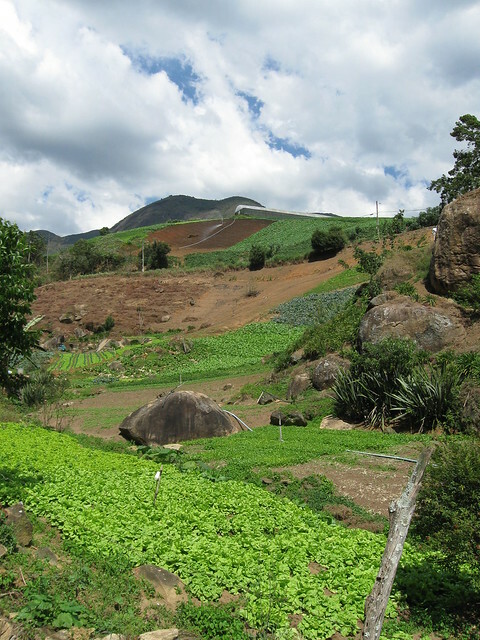 We would have to go back the way we came, by foot, through the hills, a three hour trek to Laranjeiras. Only trouble, this time the rain was coming down by the sackful and had been doing so for the past two days. What had previously been a difficult trail to follow in the sun would now more closely resemble a water slide. So when one of the locals came up from the beach to say that actually we would be able to get a boat, this felt something of a relief. The boat came in from one of the other beaches, it caught a big wave on the way into the shore and ploughed headfirst into the rock at the end of the beach. The driver thought this was hilarious. We all hopped into the boat and waited for a break in the waves. Earlier that day, I thought we had lost one of the Swiss girls, Andrea. She had swum out during one of the calm spells only to suddenly be hit by three of the biggest waves I had ever seen. Each time one was about to hit her she had jumped through the wave, and each time I was almost surprised to see her head pop up again at the other side. Once she got close to the beach, I had to run over and pull her out, so tired were her arms after getting out of the waves. We had to wait for about 15 big waves to pass before we got a quite spell. During that time the young London girl, Lucy, next to me was crying. Supposedly, she thought she was going to die. I was trying to be comforting but getting it all slightly wrong (“Hardly ever do fishermen ever die out there in the ocean. We would have to be really unlucky for it to happen to us.”) We eventually got our chance, and pushed the boat out into the ocean, the driver wasting no time in getting the motor going and moving us out of the danger zone before the next group of swells. By this time the rain had picked up and the sea seemed to be getting choppier by the minute, all of which was not helped by the fact our driver thought he was in a race (I presume his dinner was on the table). All we could see on the whole journey were outlines of the forested mountains in the distance, bloated grey skies and the sea shifting from side to side, up and down, with us placed in the middle. The crying had stopped by the time we reached the other side, docking in the Laranjeiras condiminium, home to some of the wealthiest people in Brazil. We were ushered into a minibus and driven to the nearest bus stop, whizzing past an assortment of golf courses, health spas and general expensive decadence on the way. While we waited for ths bus, me and Betty, the other Swiss girl, played frisbee on a football field behind the stop. By the time it arrived we were both completely soaked and covered in mud. Next time I go to Punta Negra, I will be hoping for rain, but I feel somewhere inside I will be praying for rain. Who knew it could be so much fun? It seems I have been a little bit quiet. There are two reasons for this; gin and cachaça. After spending five days in the mountains of Petropolis and Teresopolis I headed to Rio once more, where Fabiola kindly said that I could stay with her and her sister. There seemed no better present than a bottle of gin. It was soon devoured on the Friday night. After that we started drinking beer and this seems to have killed my memory. I remember going to a house party in a favela, but remember very little while I was there. My camera was full of pictures of the kitchen of the house. I have no idea why. The next day Glenda came round and we started drinking gin again. Things were far less reckless on this night, plus I think Fabiola got upset when I went out to buy ice and came back with a bin liner full. I tried to explain that I only wanted a small amount but they must only sell to bars because they only wanted to give me a whole sack. Plus, I thought it might be funny to come back with so much ice. Maybe this is where English humour doesn’t travel so well. 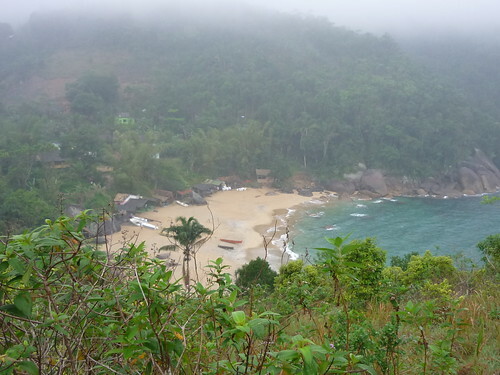 After Rio I headed to Ilha Grande, where I spent all day in the water. Perfect, clear water. Then the storm started. Everyone had to go inside. The next morning I left. I have been in Trindade for a week now. I’m helping a hostel improve their website in exchange for accommodation. They have also been providing me with food and cachaça, plenty of it. Caipirinhas and Gabrielas are de rigeur. And my head has been spinning ever since. Today it is raining so we are having a games day. Time to refuel. It should be noted though that they have edited the original to smithereens. All the bits that I though were quite amusing have been taken out, leaving the whole thing seeming a bit insipid. But worse of all, for some reason they have decided to plaster a gargantuan image of some sort of beef and bacon sandwich at the top. It has nothing whatsoever to do with the actual food mentioned, plus it makes an article which is supposed to be about various Brazilian delights seem, well, disgusting actually. At least I’m getting financial recompense. I was going to write some more here but I believe the person before me must have tried to make a jam sandwich out of this keyboard because this sentence alone has taken at least five minutes to write! No more cleaning, my time at the hostel is finally up. To be fair, I did very little cleaning, but any cleaning is too much I’m afraid. I decided the best place to go after spending a month on the beach was the mountains so headed to Petropolis. I arrived yesterday to find the only hostel in town had been closed, meaning I would probably have to spend more than I wanted. I tried to find a couchsurfer here too but out of the four that live here only one replied, and he was out of town on business. I eventually managed to find a 93-year old German Brazilian who owned an Inn. We watched the US Open and I found out about skin diving (apparently doing this with an aqualung is just plain cheating) until his receptionist turned up. It turned out that the old man had told me the price was R$99, I thought he said $29. This was just too high to even begin to find a compromise so I moved on, feeling slightly gutted that I wouldn’t get to see his skin diving photos. No-one in town could recommend anywhere even close to the R$30 I wanted to pay so in the end I had to make a sacrifice. The cheapest place I could find was R$88. I managed to barter him down to R$66 which we shook hands on, though afterwards he tried to explain to me that 66 is basically the same as 70 so I might as well just pay R$70 yeah. No way! It’s twice what I wanted to pay but I figure after not having to spend a penny on accommodation for five weeks, and also having access to a swimming pool, amazing breakfast and general swankiness I can’t complain too much. By the prices of the hotels here it seems that Petropolis is very much a place for the Cariocas of Rio to come and spend their money when they feel the need for a break from the beach. It is certainly a grandiloquent place to come, full of palaces and regal glamour. Santos Dumont, who I believe was one of the first people to fly came from here, as did some of the old Brazilian royalty. For me, it’s again just a huge reminder how big the gap is between the rich and poor in Rio, or even the gap between middle class and poor. You’re looking at middle class people earning at least 3 or 4 times as much money as those on the lowest paid jobs.